Recently, a tourist was found attempting to smuggle four iguanas out of the Galapagos Islands in a suitcase. This situation was horrible and thankfully the man was stopped and the iguanas are safe. The story created outrage, but it also reminded me that iguanas are a unique and amazing species. While there are still iguanas throughout the Islands, they have become extinct on several islands and are on the endangered species list. You Have to Love Him! 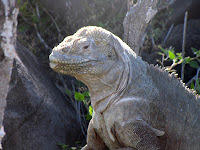 Land iguanas still can be found on Isabela, Santa Cruz, Fernandina, Seymour, South Plaza and Sante Fe Islands. 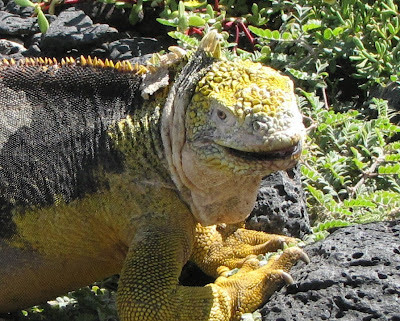 The land iguana is a yellowish lizard and generally larger in size than the marine iguana. It has a very tough, leathery mouth; thus is it able to feed on the prickly pear cactus, its primary food source. The Galapagos land iguana grows to a length of three to five feet with a body weight of up to twenty-five pounds; size and weight are different on different islands. 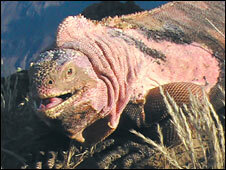 There is another separate species called a Pink Iguana located at Wolf Volcano on Isabela Island. Like marine iguanas, as discussed below, land iguanas are cold blooded. They just love basking in the equatorial sunshine and cooling down in the shade of a rock or burrow. 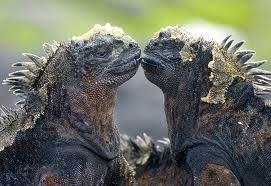 Land and marine iguanas have similar mating and breeding habits as well. Land iguanas can live to be 60 years old. 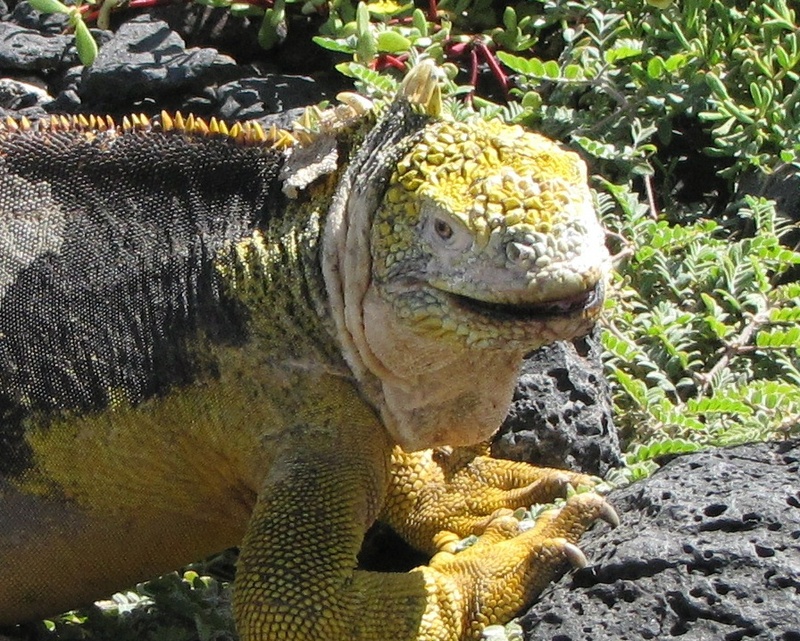 There are no land iguanas on Santiago Island, mostly due to non-endemic predators, such as feral dogs and cats, as well as humans. This is a tragedy, particularly when you consider that Charles Darwin's report that when he tried to pitch a tent on Santiago, he had a hard time finding enough space because the iguanas were so prolific. They are also extinct on Baltra and southern Isabela. In 2009 the BBC News reported that the National Academy of Sciences was researching a unique species of pink iguana on Isabela at Wolf Volcano. There are fewer then 100 of this species of land iguana. They do not cross breed with the more familiar yellowish land iguanas and their crests and head shapes are different as well. This spectacular video, again from my friend Alex of AquaSurround, will give you a better and more complete understanding of how marine iguanas spend their days and survive on the archipelago than words. 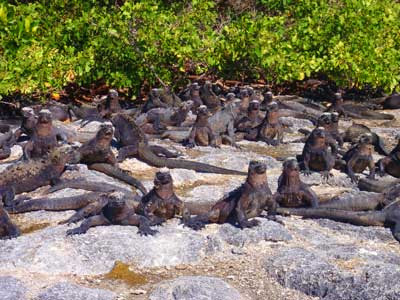 It shows the marine iguanas in every aspect of their lives. Watch the iguanas swim, laze in the sun and even spit salt on themselves! Don't Step on the Iguanas! 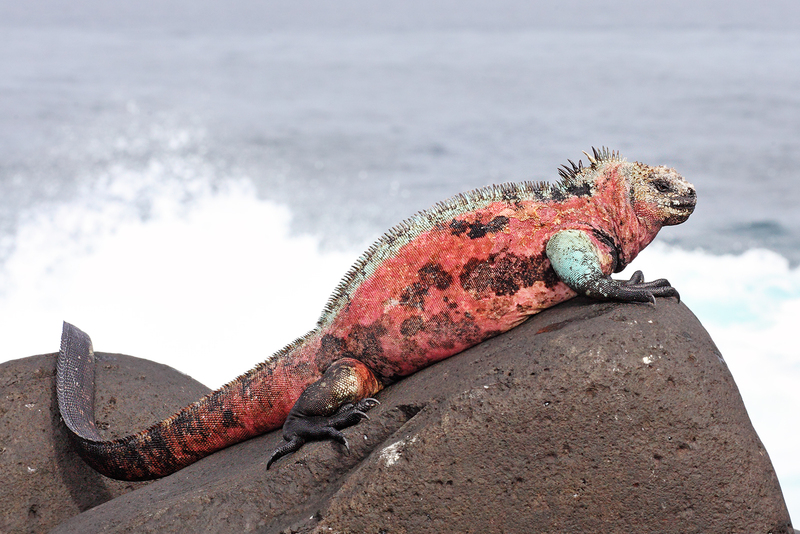 Galapagos marine iguanas - like so much in our island paradise - are unlike any other creature on our planet. They are the only sea-going lizards anywhere in the world.This is true even though all iguana species are known to be good swimmers. Although the lizards from each island are distinguishable in color, size and features, they are all the same species. Their differences are, like so many things throughout the archipelago, natural evolutionary adaptations to their surroundings. The color differentiation provides the very best means of camouflage and protection. Iguanas on every island are born black in color, and become more colorful as they get older. Actually, as is the case with many animals, the males develop colors to attract females, while the females tend to remain in shades of gray to black. This iguana is basking in the sun on Espanola Island. It is identifiable by its reddish hue. The red comes from the specific type of red seaweed that it ingests and that blooms only on Espanola. These are generally believed to be the most colorful of the marine iguanas. These iguanas from Santiago are have different coloration. Often the Santiago iguanas appear to have a greenish tinge. In addition to being distinguished by colors, male and female iguanas may be distinguished by their size. Generally, females are smaller than their male counterparts. It is the largest male iguanas that are the most sea-going. Another amazing feature in marine iguanas is that when there is not much food around, they not only lose weight and become thinner, but also they get shorter in length. Then, when there is enough nourishment and they start eating again, they regrow in both length and weight. Part of their backbone shrinks. Adult iguanas can switch between growth and shrinkage repeatedly throughout their lifetime. The Galapagos iguanas eat a strictly vegetarian diet. They eat seaweed and algae. Their food is as likely to come from the lichen growing on the rocky shore or a tidal pool as from the ocean itself. In the video you can see the iguanas skimming the rocks to eat the algae. Marine iguanas have a blunt nose, which allows them to scrape algae off the rocks with their sharp teeth. Large male iguanas are very strong and can be as large as four feet long; half of this its tail. The large males have enough body strength to swim past the waves and dive underwater for food. Each dive usually lasts about 5-10 minutes, but the iguanas do have the capacity to be under water for as long as 45-60 minutes. They become more aerodynamic underwater and swim by moving their bodies and long flat tails from side to side, with their legs held to their sides. Also, marine iguanas have long, sharp claws which give them the ability to hold onto rocks along the shore without being pulled away by the waves. Marine iguanas, like other reptiles, are cold blooded, meaning that they take on the temperature of their surroundings, unlike humans and other mammals with self-regulating constant body temperatures. Cold blooded creatures become hot in a hot environment and cold in a cold one. Thus, when swimming in the Pacific Ocean with its cold currents, the iguanas become cold. Their blood moves away from the surface to preserve heat and their heart rate slows. These animals have had to find other natural adaptations to regulate their body temperatures. What they have done is become sun bathers! At any time on any of the islands, you might find literally hundreds of iguanas soaking up the rays in order to increase their metabolism. This adaptation is very refined. The iguanas lie on top of each other to absorb and maintain the heat level. They lie perpendicular to the direction of the sun to maximize the amount of sun that falls on their skin. They are able to expand their rib cages to increase surface area for absorbing the sun and may even darken their skin, as dark absorbs whereas lighter tones reflect the heat. If an iguana gets overheated, it just slithers back into the ocean or under a bush or into a burrow and turns its body parallel to the sun. The fact that dark absorbs and retains heat also explains why the iguanas are usually found basking on black volcanic rocks. During cooler times, the iguanas huddle in masses to retain heat. Too, sometimes you will find the iguanas on a sandy beach or in the mangrove trees, depending on the island on which they live. A really intriguing feature about marine iguanas is that sometimes they look as though their heads are lighter in color than their bodies – sometimes they look white or even as though they are wearing a wig. This is not coloration at all, but the result of their desalination process and is a crust of salt on the iguana’s head. When diving in the ocean, the iguanas inevitably swallow salt water, but they cannot digest this water. So, they have developed special glands between their eyes and nostrils that collect and remove the salt. They shoot it out in a spray – like sneezing (this can be seen clearly in the video). Sometimes – in fact, often – the spray lands right back on the iguana’s own head covering him in a white mist. This is just another example of an adaption that has evolved to enable these descendants of terrestrial ancestors to live in salt water. Like many other species, marine iguanas live in large colonies and the males become territorial and combative during breeding season in February and March. The males who are vying for territory and mating privileges engage in very intense combat, with head butting, pushing, shoving and locking of the crests on top of their heads. The fighting can last up to five hours. For all this intensity, the loser leaves without injury and the victor gets the girl! Immediately thereafter, she leaves. After a five-week gestation period, she lays her eggs in a soft sandy nest that she has dug and the babies are born in May and June. Baby iguanas are tiny, and weigh just 1 ½ to 2 ½ ounces and are only about 6 inches long. It takes a hatchling about two years to develop the strength to swim. Iguanas are a protected species in the Galapagos Islands. The Galapagos Marine Iguana is considered vulnerable in the International Union for Conservation of Nature Red List of Endangered Species. 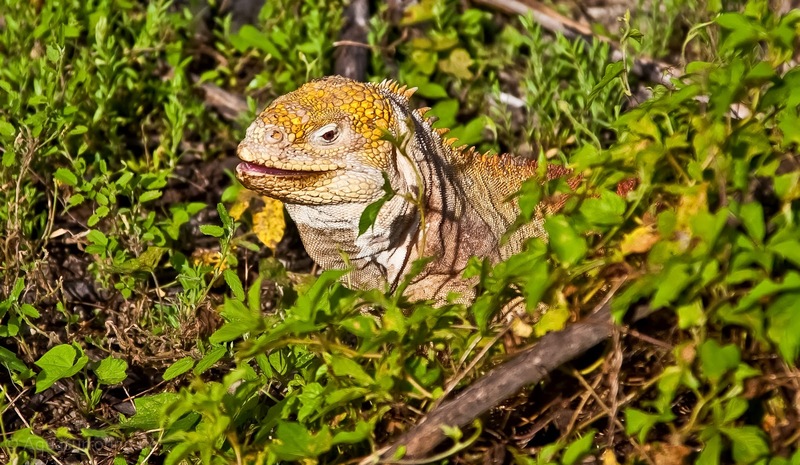 The Galapagos National Park Service has created artificial nesting sites on some of the smaller islands away from predators in order to preserve the iguana population. 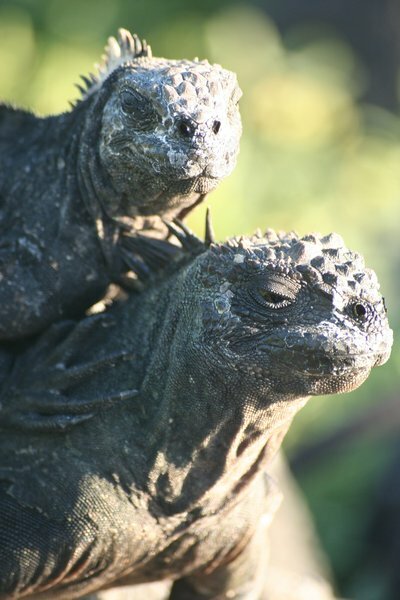 Whether classified as land or marine, iguanas are strange, fascinating and unusual. We have to do everything in our power to protect this fabulous example of adaptation and evolution. Thank you for this post to share. I like this post to read. Land iguanas still can be found on Isabela, Santa Cruz, Fernandina, Seymour, South Plaza and Sante Fe Islands. If you want essay related topic you can take online essay writing service help through custom essay writing service before the exam. I enjoyed reading this for my a.p.-biology class.